Bianco Smile has bundled up two of our most important whitening products to help you whiten and maintain your teeth. Whiten your stained teeth up to 14 shades with our teeth whitening kit which uses the highest legal grade whitening gel available on the market. Further whiten teeth by using our natural activated charcoal powder and absorb any bacteria maintaining your freshness of breathe. Highest grade whitening gel on the market. 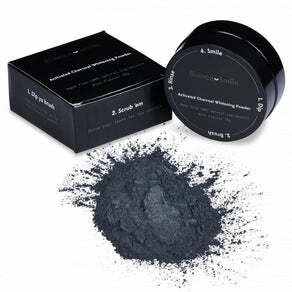 Activated charcoal powder for regular use. 2) Scrub - Scrub your teeth with the charcoal powder or toothpaste for 2-3 minutes, covering all surface area of your upper and lower teeth. Do not swallow the powder or toothpaste. 4) Wash - Place your mouthpiece in hot water for around 10 seconds. 5) Mould - Place mouthpiece in your mouth while soft and mould to your teeth - do so by lightly using your fingers and tongue to push the mouth piece tight around your upper and lower teeth. 6) Gel - Once the mouthpiece is firm, place a small amount of whitening gel in the upper and lower mouth trays. 7) Apply - Place in mouth, along with LED light - turn LED light on, and leave for 20-30 minutes. 8) Smile - Enjoy a complete Bianco Smile! This is a second time I have purchased this product. This is a second time I have purchased this product. I purchased these because I wanted visible results in a short amount of time. And that's what you get from this product. Fast acting with minimal time required to keep it on your teeth.